Our weekly recommendation, perfect for summer. Ah, summer, a great time for kicking back on the porch and enjoying a cool beverage. If that beverage happens to be a classic cocktail that helped to kick-start America’s ongoing love affair with vodka (still by a wide margin the best-selling spirit in this country), then all the better! The Moscow Mule is a simple combination of ingredients, but don’t let that fool you; it’s a nice little potion that can be adjusted to your liking, whether you’re looking for a light tipple or something with a little more oomph. The Moscow Mule is commonly associated with Smirnoff vodka, and with good reason; the drink was heavily promoted by John G. Martin, president of G.F. Heublein Brothers Inc, who’d secured the rights to distribute the vodka in America. In the early 1940s, ginger beer was enjoying something of a popularity spike. 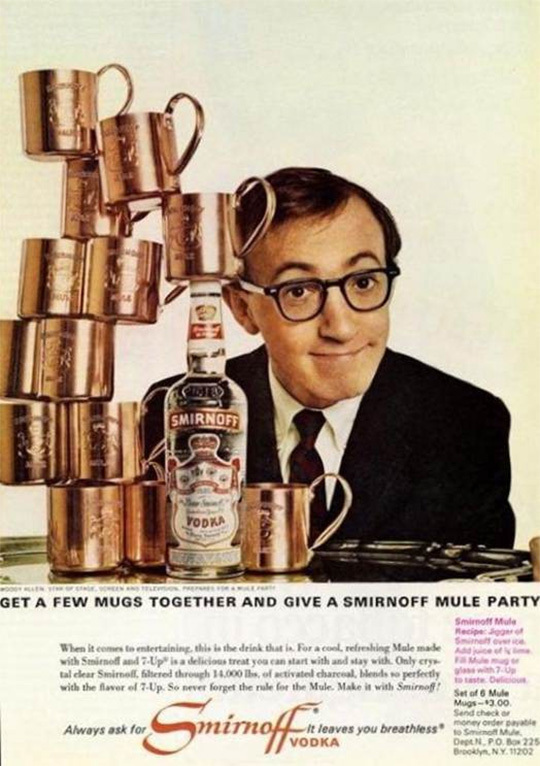 Martin toured the country relentlessly, convincing bartenders to make the drink and to pose with it—holding up the copper mugs he insisted it be served in—for photographs. Soon the beverage was enjoying a moment, not unlike the mojito experienced in the mid-2000s, where you could find it readily available at just about every bar in the country. This, along with Smirnoff’s infamous “It Leaves You Breathless” ad campaign (which insinuated that you could get in a drink or three at lunch without anyone smelling it on your breath), was an instrumental part of vodka’s conquering of American drinking culture. The key to a good Moscow Mule is a good ginger beer. Don’t waste your time with ordinary ginger ale. The real stuff has bite too it and can stand up to being diluted by the vodka and the ice. Reed’s makes an excellent ginger beer that comes in both regular and extra strength. I like the latter for this drink—it’s got some real burn!—but if you’re new to ginger beer, you might want to start with the regular. Combine vodka and lime over ice in a copper Moscow Mule mug (or, failing that, a highball glass), and stir, slowly topping with ginger beer. Garnish with a lime wedge and serve with a straw. I’m sure this makes me a heathen, but switching out the Vodka for some Bulleit Rye in this drink is actually my favorite mixed beverage. Doesn’t sound like a heathen drink to me at all! Find any classic cocktail, and you’ll find variants that swap out one ingredient for another. If you’re more of a rye man than a vodka man (and I’m with you on that one), then by all means pour away. Drinking what you like is always key. Jack Daniels Tennessee Honey in ginger beer/ale is superb. Substitute lime with a lemon. Awesome. Try it. Same mixture ratio.